While the amazing Kate McDermott of Art of the Pie is in town teaching people how to make the most glorious pies, I thought I would share a pie she and I and our friend Debi Koenig whipped together a couple of years ago, this beautiful Kahlua Cream Pie with Chocolate Cookie Crust. It is based on Kate’s original Grasshopper Pie. When I joined IAPC (International Association of Cooking Professionals) I went to my first event very nervous because I did not know a single soul in the room. Knowing there would be other people there that were as uncomfortable as me helped a little. And then someone asked if the chair next to me was taken – I looked up and saw a lovely lady with a welcoming smile and the most beautiful blue eyes, twinkling with happiness. That woman was Kate McDermott, and it was kismet that we sat together that morning. I was captivated by Kate and the stories she was sharing. She passed around a photo of the most glorious rustic pie and explained she had made it in a Dutch oven over a campfire. This was a kindred soul and I knew it instantly. Kate is the author of “Art of the Pie: A Practical Guide to Homemade Crusts, Filling, and Life” an award-winning cookbook you can get today. And her second book, “Home Cooking with Kate McDermott” is dropping Oct 16th and you can pre-order it today on Amazon! I saw part of it this weekend and it is going to be another winner – buy it now!! Debi and I met in junior high, were friends through high school and then went different directions. Years later we met again at a class reunion and have enjoyed renewing our friendship. Still the same sweet gal I knew but even more fun today! She is a very talented home cook and excellent baker – another kindred spirit! When the three of us get together, there is always laughter and lots of creative ideas fly. This night we decided to design a new pie just for Chocolate Monday! 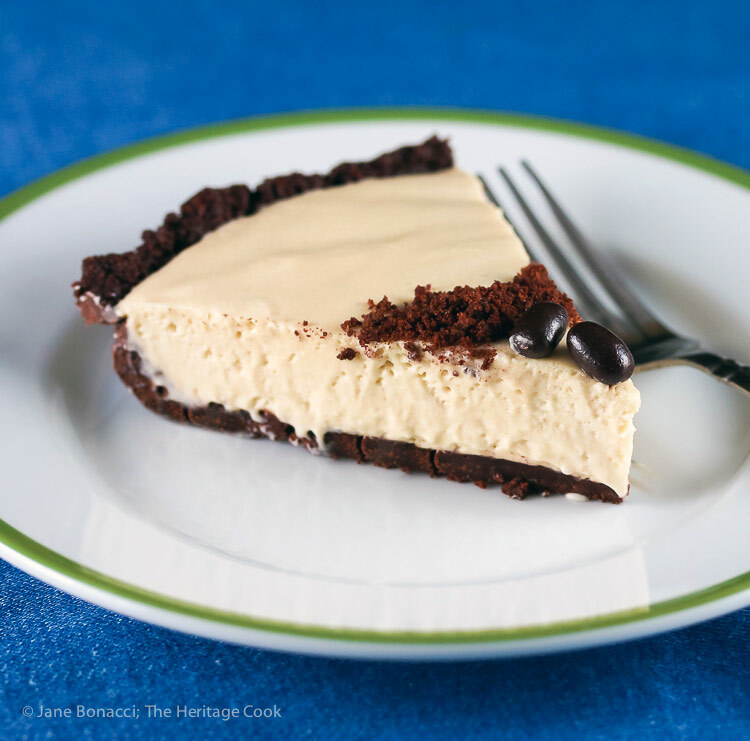 This Kahlua Cream Pie with Chocolate Cookie Crust is incredibly easy to make – perfect for little hands to help – no baking required. You can use a stand mixer, hand mixer, or even whisk by hand. If you want a good workout, use the whisk. The only part that requires “cooking” is melting the marshmallows. Supervise that part and let the kids do all the rest. They will love the sense of accomplishment and kudos they get when everyone enjoys their pie! Have a wonderful week and Happy Chocolate Monday! Prepare the Crust: If you haven't already, crush the cookies into crumbs either in a food processor or with a rolling pin. Mix them together with the melted butter. Press the mixture into a shallow 9-inch pie plate creating a crust. Refrigerate while you make the filling to firm the crust. Make the Filling: In a bowl set over a pan of simmering water, combine the marshmallows with the half and half. Heat, stirring, until the marshmallows are nearly melted. Carefully remove from the heat and finish melting the marshmallows, stirring constantly. Let the mixture cool while you whip the cream. When the cream has reached firm peaks (the will stand up with the tips bending over), whisk half into the melted marshmallow cream mixture. Once it is fully incorporated, fold the remaining whipped cream in until there are no more streaks. Add your choice of liqueurs and whisk until completely blended. Pour into the chilled crust, smoothing if needed, to the edges. Return the pie to the refrigerator and chill for at least 1 hour. Decorate and Serve the Pie: Sprinkle the cookie crumbs decoratively over the top of the pie and add some chocolate-covered coffee beans or something that tells people what the flavor of the pie will be. If you chose to use mint in the flavoring, you would use some mint leaves as a garnish. If you used citrus, add some thin slices of the matching fruits. Cut into wedges and serve with a dollop of whipped cream if desired. ** For a non-alcoholic version, you can add more heavy cream. You can add flavor by infusing it with your favorite flavors using extracts or steeping the cream with ingredients such as citrus, coffee beans, or fresh mint leaves. If you want to make this for St. Patrick's Day, use Kate's original recipe (http://artofthepie.com/green-grasshopper-pie-st-patricks-day/) with Crème de Menthe for the green color. For a gluten-free crust we used Pamela's Gluten-Free Dark Chocolate Chunk Cookies, pulsed in the food processor. You can use any gluten-free chocolate cookie you like. The amounts in the ingredients are for a 9-inch shallow pie plate. If you are using a deep dish pan, increase the crust to 2 cups cookie crumbs and 4 tbsp of butter. No need to increase the filling. By Kate McDermott, Jane Bonacci, and Debi Koenig © 2016. All rights reserved. I’m so glad I tried this cream pie. It turned out to be so good. Thank you so much for the recipe. Im coming back next week for another great recipe.